January 1, 1993 A unique exhibition of approximately 70 ladies’ shoes and boots and the curious role these items have played in the lives of the women who wore them will go on long-term view at The Brooklyn Museum March 17, 1993. Fancy Feet: A Historic Collection of Ladies’ Footwear from The Brooklyn Museum will give a historic overview of highheels, slippers, platform shoes, boots, and mules, ranging from the oldest shoes in the Museum’s costume and textile collection, a pair of sixteenth-century platforms, known as Chopines, to Charles Jourdan’s 1965 patent leather slingback Shoe. The footwear will be displayed in six style categories: the “Louis XV” shoe, the flat-heeled slipper, the heeled shoe, the elevated sole, boots for ladies, and the mule or backless slipper. The origins, developments, and fads of each category will be traced, with a look toward important influences in shoe design, like the late eighteenth-century reintroduction of right and left shoes and the invention of cork wedge shoes by famed Italian shoe designer Salvatore Ferragamo in an era of wartime shortages of leather, fabric, and steel. The exhibition will also follow the rise and fall of certain trends in shoe fashion and examine the role of women in society through popular footwear trends. For example, fashionable shoes worn in the first half of the nineteenth century, like the English silk Moccasins embroidered by a North American Indian with thread, binding, and glass beads (c. 1830), were made of such beautiful materials and were so exquisitely ornamented that they could only be worn indoors and for short distances, leaving their wearers virtually home-bound, a symbol of high social status. Platforms and high heels, such as the French brocaded silk Clog with taffeta ribbon (c. 1740), performed a similar task--by elevating the wearer’s physical stature and inhibiting her ability to move around, her social status was enhanced. The exhibition was organized by Patricia Mears, a curatorial intern sponsored by the National Endowment for the Arts, a federal agency. Brooklyn Museum Archives. Records of the Department of Public Information. Press releases, 1989 - 1994. 01-06/1993, 001-2. 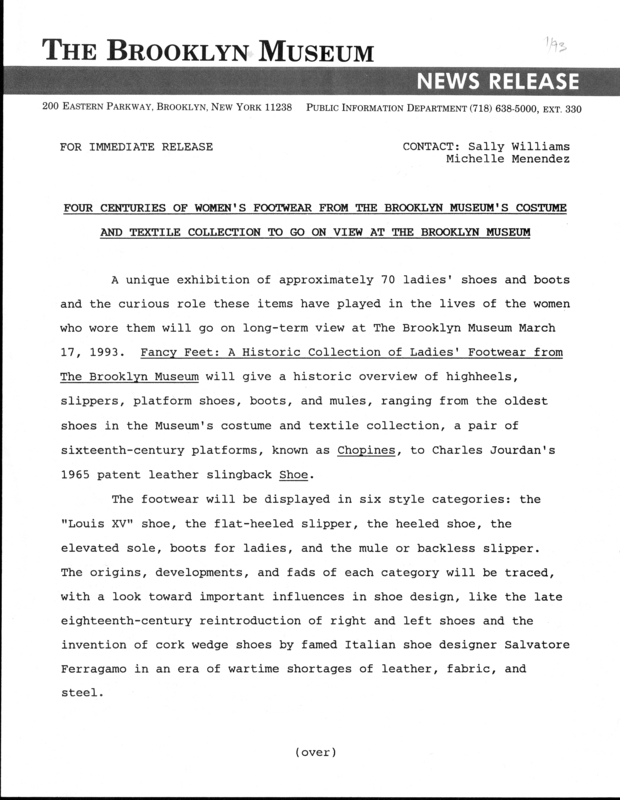 September 1, 1993 The Brooklyn Museum will continue its widely acclaimed exhibition, Fancy Feet: Four Centuries of Ladies’ Footwear from The Brooklyn Museum, replacing the 75 shoes and boots on view since March 17 with the footwear’s right or left counterparts on October 6, 1993. “Because of the fragility of the material used on most of the pieces, like lace, satin, velvet, and feathers, the shoes that have been on view for the last seven months need to be rotated into storage and their matches, carefully preserved off view until now, put out on display for a while,” said Patricia Mears, curator of Fancy Feet. The exhibition is a historic overview of four centuries of women’s footwear and the role these items have played in the lives of the women who wore them. The shoes and boots featured range from 16th-century Venetian platforms, known as chopines, to recent creations of English designer Manolo Blahnik from 1992. Also included are shoes worn by such personalities as Joan Fontaine and Lauren Bacall. 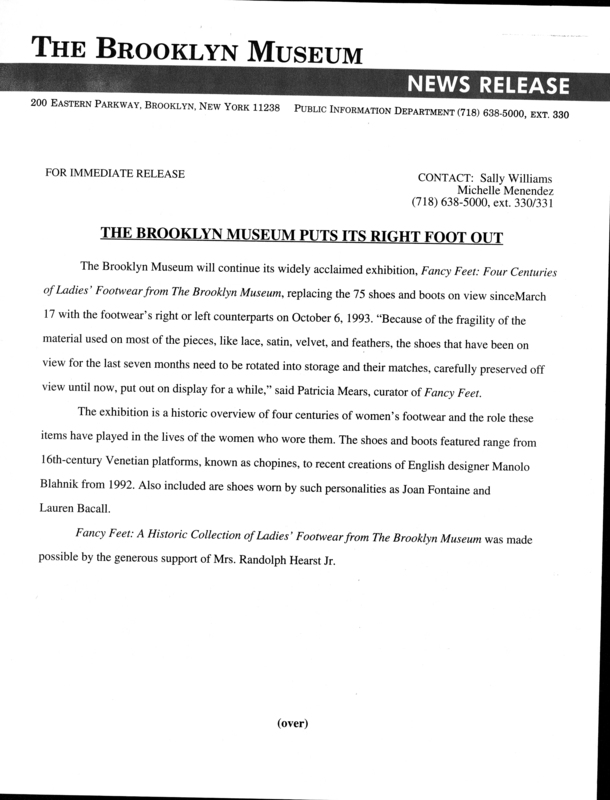 Fancy Feet: A Historic Collection of Ladies’ Footwear from The Brooklyn Museum was made possible by the generous support of Mrs. Randolph Hearst Jr.
Red Grooms’s Dame of the Narrows and the Greater New York Harbor has been extended at The Brooklyn Museum through June 30th, 1994. The exhibition, which opened November 6, 1992, consists of a large-scale sculpture of the Staten Island Ferry arriving at its Manhattan terminal. Surrounding the sculpture, which visitors are invited to climb aboard and examine, are new murals designed by Red Grooms especially for the installation, depicting the Brooklyn, Manhattan, Staten Island, and New Jersey shorelines. The presentation has been partially funded by the Marlborough Gallery. Brooklyn Museum Archives. Records of the Department of Public Information. Press releases, 1989 - 1994. 07-12/1993, 127-128.